Custom made "My Daddy Drives A Big Rig" Baby Onesie makes a sweet baby gift for the daddy to be. It can be given as a pregnancy announcement, reveal baby's gender, a cute baby shower gift, or just because. It's sure to put a smile on Daddy's face. Can be made for a baby boy to. This listing is for 1 "My Daddy Drives A Big Rig" custom onesie. 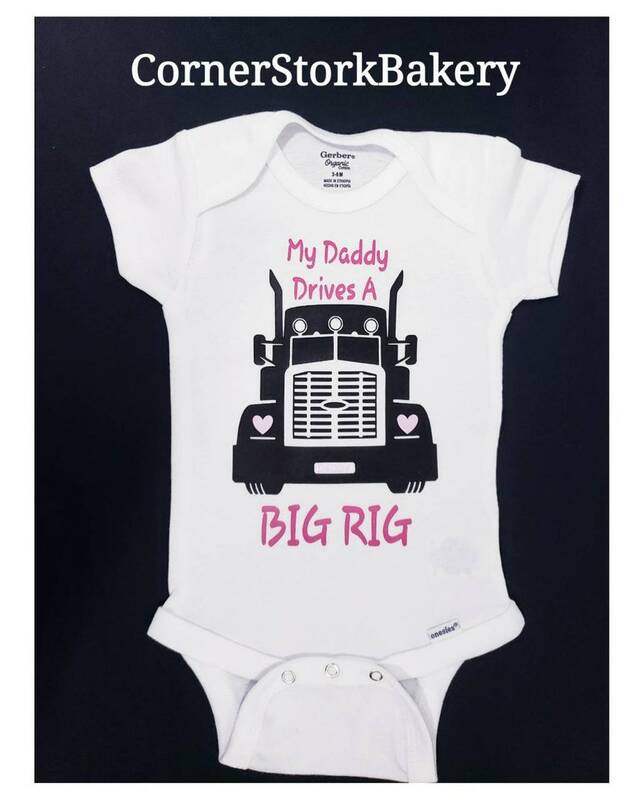 • 1 Gerber's brand white short sleeve onesie with "My Daddy Drives A Big Rig" with a big rig design made with black and pink htv. Primary color choice is for the heat transfer vinyl words. Looking for a matching bib? This link takes you to it.